Watching this film 12 years after its release, just about the only interesting aspect of Nerukku Ner for me is that it is Suriya’s debut film. At the crossroads of his life and wanting to set up a business but not take family money for the same, he took to acting when Mani Ratnamapproached him as producer along with his former assistant, Vasanth, already a director. The film, however, is little more than routine mainstream fare of two heroes at each other’s throats till they join hands at the very end to finish off the villain. The script is interesting to the point that the heroes are on opposite sides due to the parting of ways of their elder siblings who are married. But then it settles comfortably into familiar, formulaic territory as it plays out to the end. The narration is loose, meandering and fails to engross you. The standard treatment too fails to lift the film. The romantic scenes are typical, shorn of the nice, small moments that Producer Ratnam is so adept at in the films he has directed. In any case, romance is an unimportant part of the main story so one supposes the makers didn’t give too much thought to it except considering it a functional necessity and little else. And then there is the three hour running time which gets to you telling on the pace of the film. Scenes of the clashes of the two heroes go on and on with each outdoing the other in turn (were the makers keeping score?). Sequences where tension could have been created and nicely built up like when the heroes are hunting for the kidnapped Sona and she is in the van next to them and is able to see them through the darkened glass but they are unable to see her are stretched and stretched till they lose all excitement and suspense. Suriya must be cringing whenever he sees this film. No doubt, he brings a certain freshness to the film and there are sporadic moments when he does show glimpses of his boyish charm and the ability to use his eyes to convey his feelings but that’s about it. He often appears ill at ease as if not wanting to totally open up in front of the camera and, in particular, in the romantic and song sequences, he is plain awkward. Looking at him dance, you (if not him) pray that the ground would open up and swallow him up and put him out of his misery! It’s almost impossible to believe that the seasoned Suriya of Vaaranam Aayiram (2008) or Ayan (2009) and the Suriya of Nerukku Ner are one and the same person. Incidentally, he entered the film after Ajith Kumar pulled out after shooting a few scenes. Of the rest of the cast, Vijay is his usual self. The leading ladies, Simran and Kaushalya, have no roles to speak off except for the standard two scenes, two songs and are out of the film for lengthy periods of time as they are not really connected to the plot except as romantic appendages to the heroes. 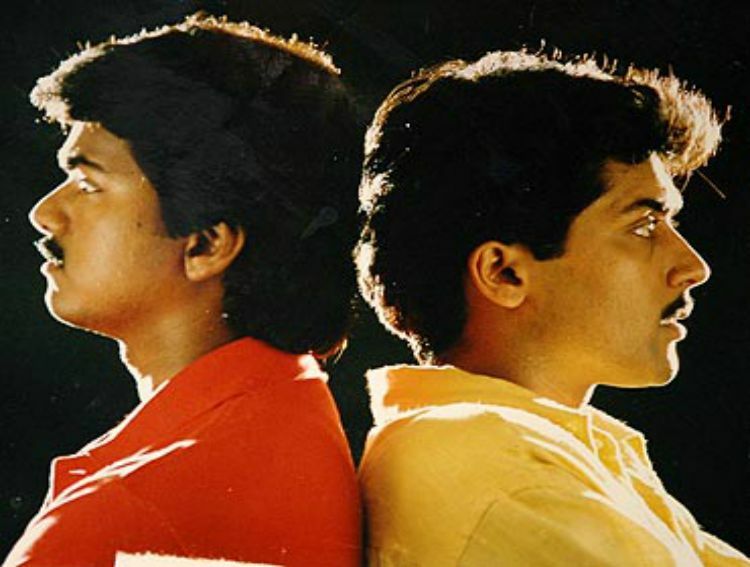 Raghuvaran and Shanthi Krishna are reliably efficient as the brother and sister of Vijay and Suriya, respectively while Karan makes a slimy enough villainous MLA. Technically, KV Anand’s cinematography is polished but as mentioned above, the film could have done with some drastic trimming as. In particular, the portion after the two heroes join hands is stretched way too long without a truly exciting climax. But then it’s easy to say this. An editor is guided solely by the material he is given. The music by Deva is adequete enough and the song picturisations are just so-so at best. What’s more, the songs bring the narrative flow to a grinding halt whenever they appear. The song shot in Kolkata with Suriya chasing Simran all over is plain strange and terribly choreographed. Still Manam Virumbuthey and Aval Varuvalaare among the better composed songs in the film and the former perhaps the best picturised and choreographed number in the film. All in all, worth watching only if you are a die-hard Suriya fan and that too so that you can see for yourself how much he has grown as an actor, since this terribly awkward debut.